Last night, The Sontaran Stratagem marked the return of another of the classic Doctor Who monsters brought back for the new series – this time being one of Russell T’s acknowledged favourites, the Sontarans. Much as with the other returning monsters the advances in prosthetic effects, and the much increased budget for the new show have made a big improvement, so rather than the rather scruffy costumes from the monsters last appearance back in The Two Doctor’s this time there really did seem to be a vast army of cloned warriors ready to take over the planet. The same can also be said of this episode’s other returnee – UNIT (now renamed the Unified Intelligence Taskforce to remove the United Nations references) who unlike the fairly small contingent of troops that used to be seen onscreen in the past rolled up with a much increased number of troops giving a much more convincing army unit. In many ways this episode was a classic Doctor Who/UNIT set-up, with a less than enthusiastic Doctor placed against Colonel Mace filling the familiar place in proceedings that in times gone by would have been occupied by Nick Courtney as the Brigadier. In much the same way Mace and the Doctor frustrate each other as the one tries to run his military organisation remaining sceptical to what is going on whilst the Doctor in familiar fashion appears like a whirlwind through a well organised plan. As at the end of this first episode of the two-parter the bulk of UNIT have yet to come face to face with the Sontarans, but I’m sure amongst the raft of other in-jokes that we can expect Mace to be ordering his troops to fire â€œFive rounds, rapidâ€? at the small chaps in the blue armour! 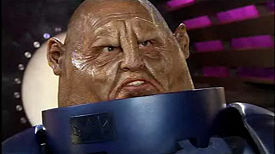 At this point in the proceedings, the actual the Sontaran plan is still unclear. The episode opened with an undercover reporter being thrown out of a school for the gifted, run by Luke Rattigan, a gifted child prodigy and millionaire. Amongst other things, his organisation has developed the ATMOS system, that cleans all carbon from car exhaust fumes, and also provides satellite navigation. The reporter, driving away tries to turn off the system, but can’t, discovering too late that it can also take over full control of her car as it plunges her into a river. The the Sontarans are providing Rattigan with assistance to produce these new devices – as we discover at the climax of the episode the ATMOS system also is the key to the Sontaran invasion plan, producing poisonous gas from installations in millions of cars across the globe. They also have the ability to clone humans – at one point cloning Martha Jones who also makes a return appearance in this episode. Previous Sontaran episodes have highlighted the strategic importance of the Earth in the ongoing war with the Rutans, so perhaps this will become more clear next week. Unlike the new Cybermen for example, the Sontarans are very much an updating of the creature, rather than a reboot, so there are still the humorous elements of the creatures that go right back to Robert Holmes original ideas where we get a great build up of military bluster from General Staal, before the Doctor briefly incapacitates him using a squash ball to injure the probic vent on the back of the General’s neck. Much as before the creatures singular military focus is actually shown to be a weakness at times, perhaps paralleled by the same limitations with regards to UNIT operating through a military view. The next episode preview of course doesn’t give much away. Certainly it looks as though UNIT and the Sontarans are going to meet face to face. It’s probably fairly certain who will ultimately win – but at what cost? New Doctor Who has always shown the personal impacts of life with the Doctor on those left behind, and with the comments that Martha makes at one point I can’t help thinking that some of that may be coming the way of Donna and her family.